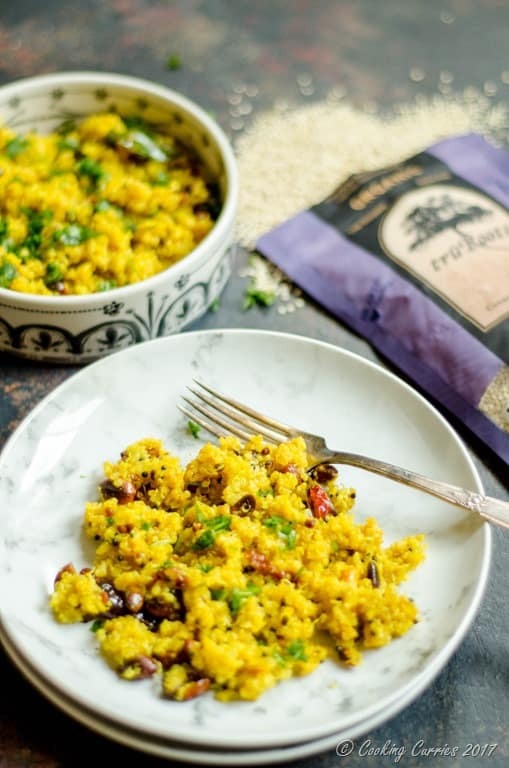 The traditional Southern Indian favorite Lemon Rice is given a more wholesome twist with this Turmeric Lemon Quinoa made with our favorite truRoots Quinoa. Ready in a jiffy and so tasty too! It is the season of festivities and from where I come, southern part of India, this thing we call variety rice is quite popular to help with all the celebrations. Variety rice is nothing but plain rice made in a variety of taste and flavors like tamarind rice, lemon rice, coconut rice, sweet sesame rice, yogurt rice and what not! It is the most delicious assortment or rice that you will ever eat! But also, eating all that much rice, that too white rice, can kinda get to you at the end of all these festivities. What with the two of us, the husband and I, trying to eat healthier – as in still eat all that we want, with all the flavors intact, but trying to make it a little better – I have to come up with twists on age old and most loved classic recipes like Lemon Rice. Quinoa is the perfect substitute for this. The texture of quinoa holds up to all the added flavors and that nuttiness gives a little extra oomph to the recipe. 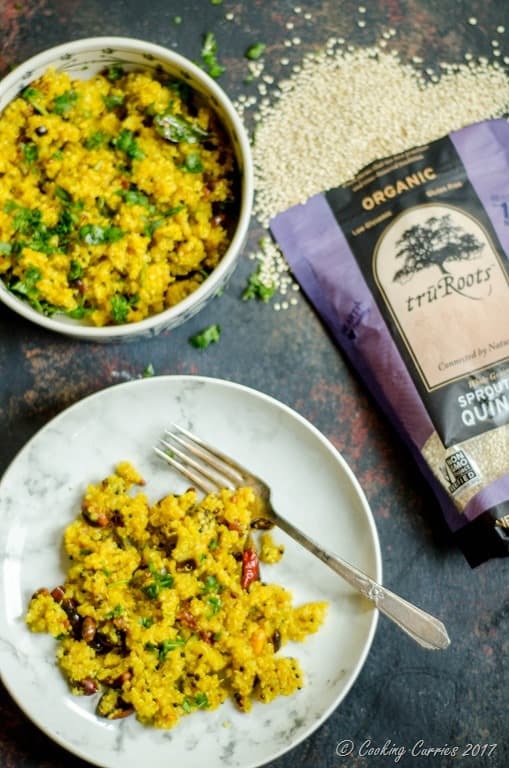 I came up with this Turmeric Lemon Quinoa recipe for us to eat a little better without compromising taste – truRoots Whole Grain Sprouted Quinoa is the perfect substitute for rice. 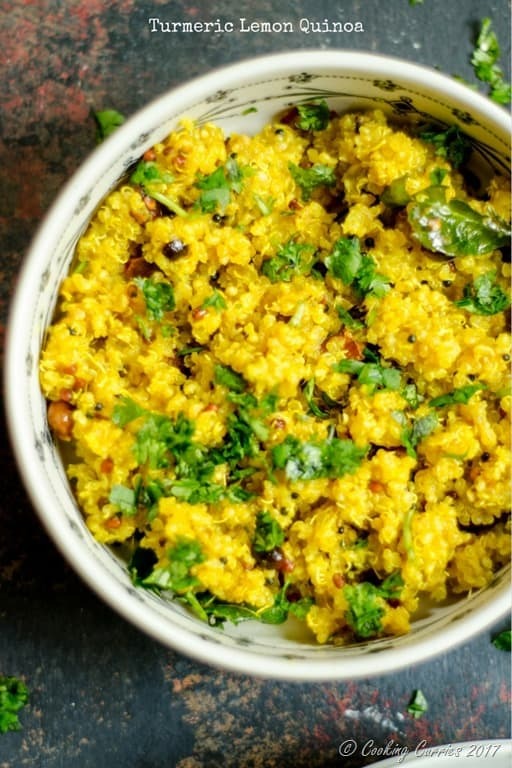 This truRoots Quinoa took me only 15 – 20 mins to cook and while it was cooking, I got everything else cooked and ready for the Turmeric Lemon Quinoa and all I had to do was toss them all together and voila, a delicious wholesome meal was ready for the family! This truRoots Whole Grain Quinoa that I picked up from my local Target is Organic and has 5g of protein for every 1/4 cup of quinoa and that is a great protein boost for a vegetarian like me. So that’s a double yay for me, aside from the fact that it is fabulously nutty and delicious. I have made the other variety of rice with this quinoa too and so far they have all been a hit! Now, this might slowly start replacing rice in my household, which is a huge thing for someone who grew up eating a lot of rice and has that in her gene-pool. You can easily find truRoots brand of Quinoa – they have several varieties of it, at the Pasta aisle along with Rice and Dry Beans. Also, right now there is an offer going on and you can save 30% on truRoots at Target by downloading the Cartwheel offer. So, yay! What are you waiting for? Its time to stock up on your favorite truRoots products! You can click here to get to the offer! 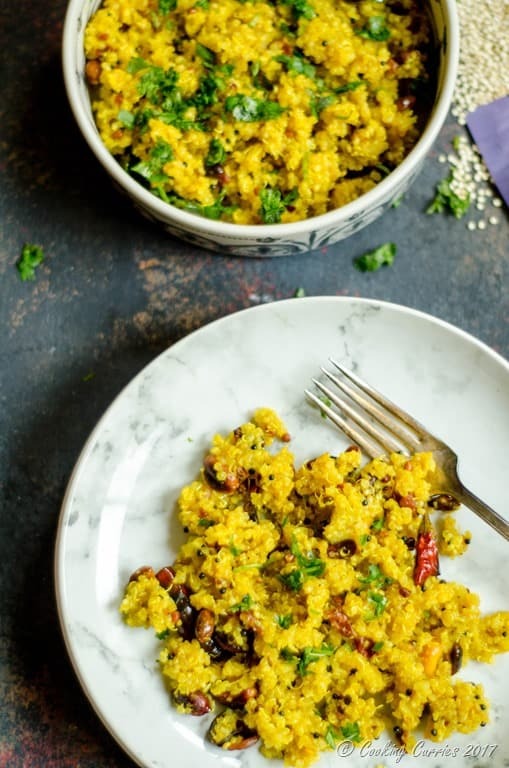 The traditional Southern Indian favorite Lemon Rice is given a more wholesome twist with this Turmeric Lemon Quinoa. Ready in a jiffy and so tasty too! Bring water and quinoa to a boil, switch off heat and cover and keep for 15 mins, till all the water is absorbed. Meanwhile, heat the oil and add the mustard seeds to it. Once they splutter, add the peanuts and cashew nuts. Roast till they turn slightly brown. Add the asafetida, urad dal , chilies and curry leaves. Give it a quick stir. Switch off heat and add the turmeric powder immediately. Add the salt too and mix well, till the raw smell of turmeric goes away. Fluff the quinoa with a fork and add to the spice mixture. Mix well. Squeeze the lemon juice over it and toss well. Garnish with cilantro and serve hot.